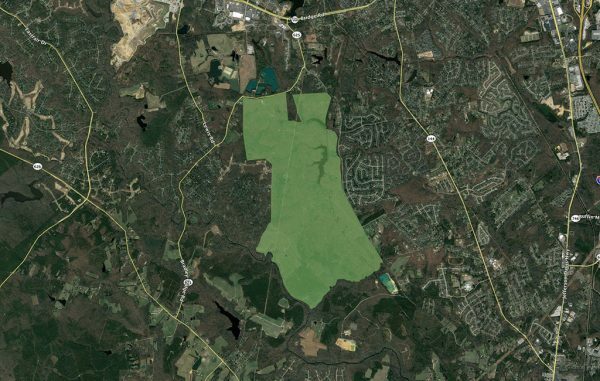 Chesterfield County’s Economic Development Authority voted this morning to withdraw its request to rezone a 1,700-acre tract it had eyed for the so-called “Matoaca Mega Site,” a project it hoped would lure a major employer to the region. The decision was made at a special meeting called by the EDA, which cited public concern about the project and how the proposal was rolled out over the past several months. The EDA met in closed session for 45 minutes before making the unanimous vote. Members of an opposition group that has vocally expressed its concerns with the project were on hand and applauded after the authority adjourned. The proposal for the megasite was introduced last year, with the idea of preparing a large parcel that could accommodate an industrial user, specifically a company in advanced manufacturing. It was touted as giving the region a chance to attract thousands of jobs and add more than $1 billion to the local economy. A series of community meetings that saw opposition from some residents ensued, with concerns about traffic and from homeowners who bought into the area expecting it to stay residential, if not rural. The EDA had planned to acquire the property, which is currently zoned residential and had been slated for a 5,000-home mixed-use development that never materialized. EDA members did discuss a desire to entertain different approaches for considering the land as an economic development site in the future.